I run to keep active. I run for my sanity. I run to ease the guilt of my indulged sweet tooth. I run from the endless questions posed by a 3 year old. I could do other things, but I choose to run. I wanted to run for a long time. I cycled home from work along the canal, passing the joggers and wondering enviously how their lives allowed them to be out exercising at that time. I couldn’t fit in a running course around my job so I pedalled on, and took solace in the fact that my commute and crèche pick-up added enough physical activity to my daily routine. For years in college, I was an avid fan of Dublin Bus, munching vending machine Hunky Dorys while planning pints for later (in my head – this was partly pre-mobiles!). When I got my first job I realised I could get around Dublin a lot faster on my trusty Raleigh Lizard purchased with my confirmation money. Seeing I wasn’t actually allergic to exercise I became a gym girl, lifting, pumping, doing too many bad sit-ups in a fast paced class while being shouted at, staring glassy eyed at Home & Away, feet thumping away on a treadmill. Then, spurred on by a minor back injury in 2005 I took up Pilates. Only this has given me pleasure and continues to be part of my routine year on year, pre-natal, post-natal, and non-natal! Learning to run was a funny thing. Kinda hard to explain to people that you have to learn to put one foot in front of the other at speed. I’d tried to road run before, and always ended up coming home beetroot-faced and sore of knee. But I learned to walk, I learned to cycle, I learned to swim and I even tried to learn to Irish Dance once even (as long as neither of my sons show Billy Elliott tendencies, I’ll get away with failing at that one). So I decided to learn to run. And, along with the birth of my second son, that was my biggest physical achievement of 2012. Funnily enough, it was that government-mandated and much-welcomed break in my paid employment they call maternity leave that finally allowed me the time to get out and start my running course when little T was 14 weeks old. I took up running in late Autumn, figuring if I could get the technique and continue through the hardest part of the year – with inclement weather and a distracting social scene (not so hectic for me with a 5 month old mind) – then I’d more than likely keep it up through the milder Spring. I went to my first few Running Made Easy classes, dreading the rain drops, but relishing running while cars clogged the road beside our group. Quickly, after my 8 week course, that fear left too as I enjoyed the cooling drops 3 or 4km into a run. 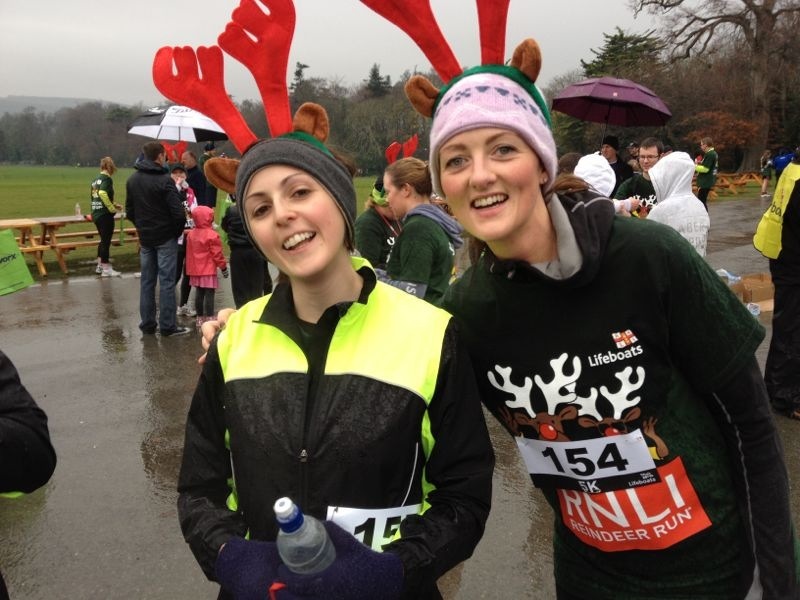 I signed up to my first 5km – jogged at a nice pace through Marlay Park with reindeer antlers thank you very much and am currently looking forward to my first 10km, The Great Ireland Run in April. 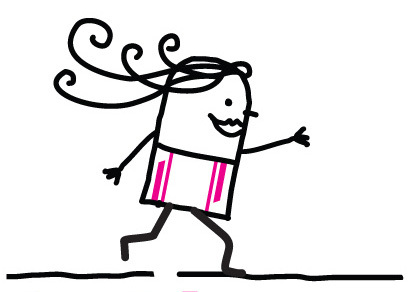 That’s actually a lie – I did do the womens’ mini marathon once, in 2004 in 65 mins with youth and adrenaline on my side. Last week I ran as snow pelted down, and I can’t say I didn’t love it. Now 2-3 times a week when my husband opens the front door home from work I’m waiting to push past him. I relish the hour with my hands free from nappies and jigsaw pieces, nothing for them to do but push through the air. My feet landing one in front of the other, unencumbered by a baby bouncing merrily to a nursery rhyme. I arrive home, refreshed, and stretch with a pre-schooler imitating and clambering on me. I’m happy, I’m loose limbed, and I’m ready for story time. I’m back to work in 6 weeks. We’ve 4 mouths to feed, mountains of laundry to do, constant tidying, wiping and playing to get through after the work-day is done. But I’m still hopeful for my fledgling running career. My body wants it now and although I know it won’t be easy to fit in, it’ll still be easier than making classes on time, or fitting in the gym. It’s only January now, there’ll be a grand stretch in the evenings anytime soon. So watch out streets, it’ll be kiddie bedtime done, then earphones in and I’ll be pounding the paths on dusky summer evenings clearing my head for the next day to come. Well done Jill, you’re very determined. I’m only at 4km but you’re inspiring me to keep going! Thanks for the comment Dee. 4km is very good! That’s 4k more than nothing 🙂 and it won’t take you long at all to get to 5k.